You may need to repair your adrenal glands as a first priority in order to get healthy. You have two of these little guys, one on top of each kidney. They put out a number of essential hormones for health, and they respond to, and can be damaged by, a number of life's less desirable occurrences. Adrenal hormones release into your bloodstream. They include: A) The blood sugar hormone that keeps your energy up between meals. If it is low, fatigue, headaches and other symptoms of hypoglycemia (low blood sugar) result, B) The anti-inflammatory/anti-pain hormone "cortisone" that keeps your body from pain, as well as from inflammatory and auto-immune illnesses. These include illnesses whose names end in "itis" (inflammation of) such as colitis, dermatitis and bronchitis, C) The salt balancing hormones that tell your kidneys to not lose all your essential mineral salts into your urine. Reductions in these play a role in such things as abnormal swellings of the body, and heart malfunctions, D) Adrenaline which gives you bursts of energy in "stress" situations, and E) Estrogen for the post-menopusal woman that helps her stay more hormonally balanced. The adrenals make the only source of estrogen (female hormone) in the body after menopause. Because of the profound effects of these hormones, if they are out of balance, big problems are the result. Temporarily they may be pushed into high gear by stress or incorrect eating, which later eventually leads to their burnout. Burnout of the adrenals underlies a great many health problems, and worsens symptoms in the areas of your body that you have already weakened elsewise. 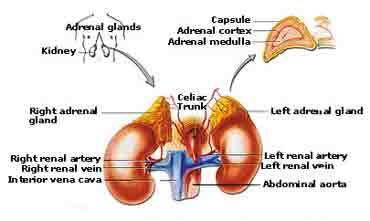 Your adrenals are also known as your "Stress Glands". Mental and emotional stress, worry, anxiety over love, money, family, any of the usual (or unusual) sources, will eventually burn out the adrenals, and cripple their hormonal output. The man who figured this out was awarded the Nobel Prize in science. He also discovered that other types of stress besides emotional can burn them out. Physical or chemical stresses can also causeadrenal burnout. Ongoing pain, nerve system stress and malfunction, stimulant drugs, caffeine, nicotine, and alcohol are on that list. Despite the fact that the highest award in science was awarded for this understanding, and it was broadly written, few medical physicians give much thought to, or have approaches for assisting adrenals to repair or function. This comes as no surprise since most medical physicians are not trained or comfortable to practice nutrition. If you have a chronic inflammatory disorder, generally medicine or drugs are merely symptomatic treatment. Colitis, laryngitis, vaginitis, (notice the "itis" endings) are often medically incurable. They are just forever treatable with drugs, only to reduce the symptoms temporarily. This is because the anti-inflammatory drugs do not treat causes of problems, but only symptoms. Headaches and migraines similarly have important adrenal (and blood sugar) components. Asthma and allergies have vital adrenal underpinnings. If ongoing medication is your recommended course, with no real end in sight, think then about strengthening your adrenals and fixing whatever else is contributing to the problem. When your adrenals are weak, the things that are harming them are generally winning, and those that could help them are losing. If you want to turn that around, you must try to discard or minimize the harmers, and bring on and support the helpers. Stress factors should be handled, corrected, imbalanced eating repaired, to name a few possibilities. Here we know how to help you with these.